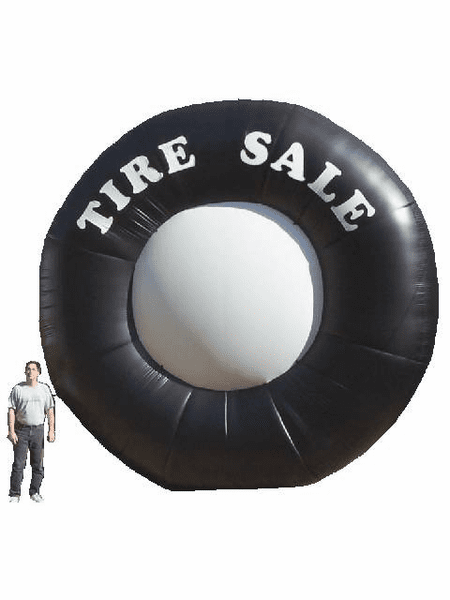 20' Tall Giant Inflatable Tire. Great for car dealerships, tire stores, or anywhere you want to draw attention. Banner can be attached to center. It can also be custom made for your specific needs. See the man standing beside the tire? That's my boss. He's 6' tall. Yeah, that tire is HUMONGOUS. Can you imagine how many people would see it if...I don't know...if you put it on your roof? People would see it from a MILE away! Even in a parking lot or beside the street. People WILL DEFINITELY see this GIGANTIC tire, which would increase your profit. And it's easy to set up and easy to take down. And whenever you have a sale going on, just inflate it and the world will know.